Why is everyone so obsessed with this hashtag and the fact that it was in Twitter’s trending topics list the morning after the first presidential debate? Perhaps the competitive nature of a presidential debate — the fact that there’s supposed to be a “winner” — means that we’re reading into any available data point. Maybe due to the nature of this specific election cycle, where facts seem to have become subjective, as people in online echo-chambers consume what they want to believe. Or maybe because Trump gleefully announced his status as #1 on Twitter trends, as if implying this means he won the debate. Later in the afternoon things got much more interesting, as rumors spread about a potential Russian connection, specifically pointing to the image below. 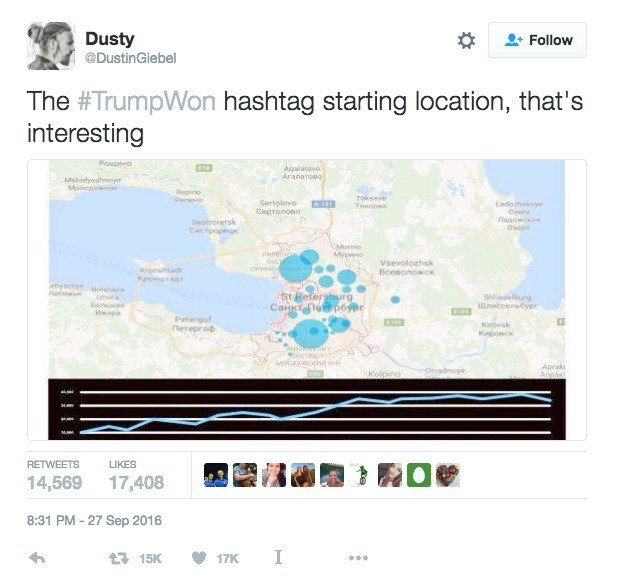 The map suggests that the #Trumpwon trending topic had started in St Petersburg, and its source (@DustinGiebel) claimed that he grabbed it off a service called TrendsMap. The image was shared over 14,000 times, later debunked by a number of sources, including the Washington Post. Last year John Borthwick and I published a lengthy analysis on Media Hacking — highlighting ways in which players are finding smarter and more elaborate ways to gain attention. We described the importance of understanding one’s position within a network, which helps filter out noise, and identify an underlying agenda that may be driving communities of interest. Over the past year we’ve been building a new network-based data product — Scale Model — which has recently launched out of betaworks. I decided to use it to figure out what happened with this hashtag. In order to make sense of this event, I started off with two datasets. The first- a list of locations where the hashtag #TrumpWon trended, sampled from the REST API every 5 minutes (raw data here, timestamps in UTC). The second — a list of the first 100k tweets posted to the hashtag. For starters, the hashtag never shows up as trending in any Russian city. When we use a dispersion plot to view the data, it is clear the trend began in Baltimore and Detroit, but very quickly jumped to ‘Worldwide’ status, and pretty much stayed there for a few hours, as it began to spread across Australia and the UK. Dispersion plot of earliest locations where #TrumpWon had trended. 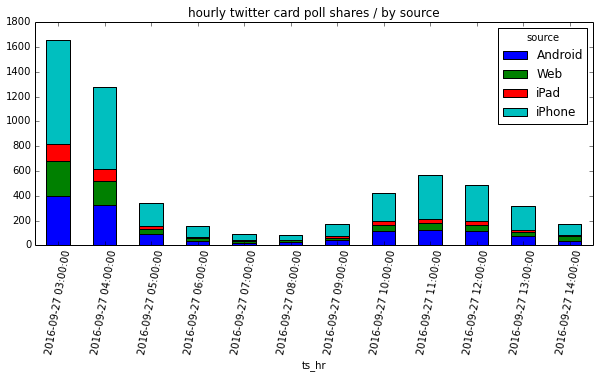 The x-axis represents 10-minute time intervals, where the first was taken at 6am Eastern time. The hashtag reaches the `Worldwide` trending topics list by 7am Eastern time. From studying Twitter’s trending topics algorithm in the past, it was understood that both novelty and acceleration were important factors in attaining a high trend score. Additionally, Twitter takes into account one’s IP address when calculating trends. The `Worldwide` category is a form of aggregate, looking at novel and rapidly accelerating terms and phrases being used across users across all regions. Typically you see a trend jump from one city to another before reaching country-wide or world-wide status. This was not the case here. There was a group of highly-organized users who all posted the exact same message at around the same time, from (seemingly) different geographic locations. These exact same message was published by thousands of accounts, likely all over the world, a few hours after the debate had ended (between 3–5 am UTC time). 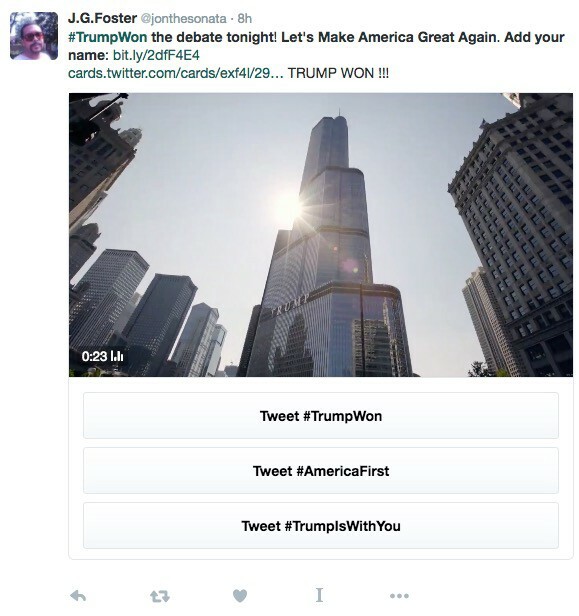 By the time folks got up in the east coast, Twitter timelines were filled with these prompts to tweet #TrumpWon —likely generating enough acceleration for the hashtag to reach worldwide trend status. 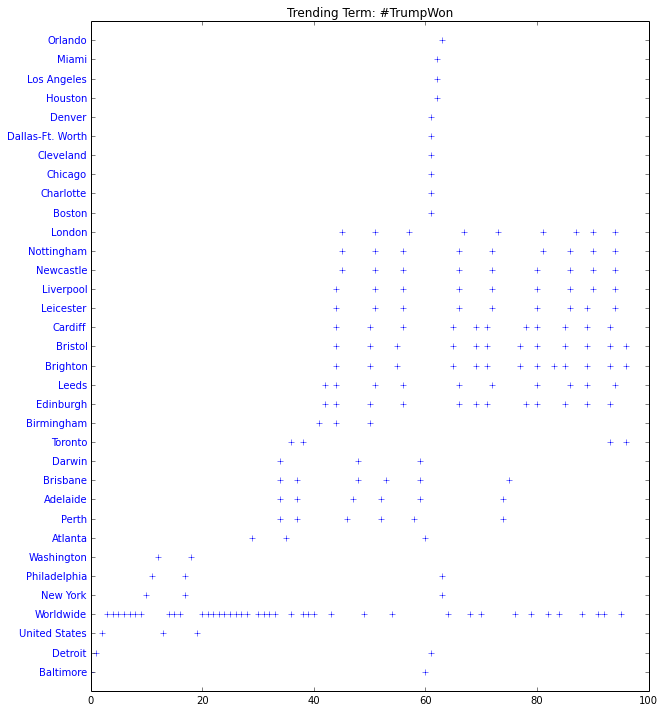 I used the list of users who were first to post to the hashtag as an input to build a community on Scale Model. 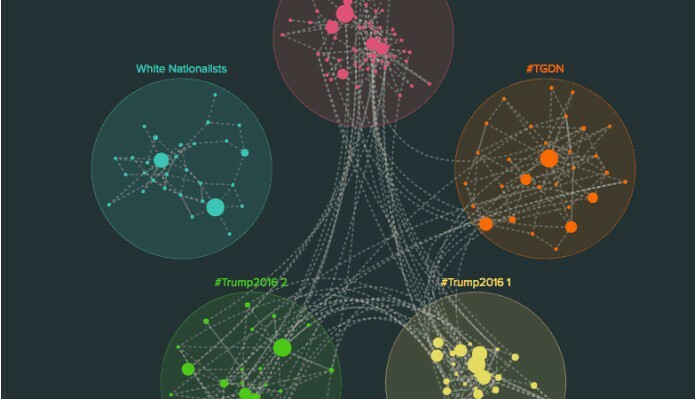 Below we see a network graph of these users and their connections (who follows whom). The larger a user is the more important they are within the context of this group. 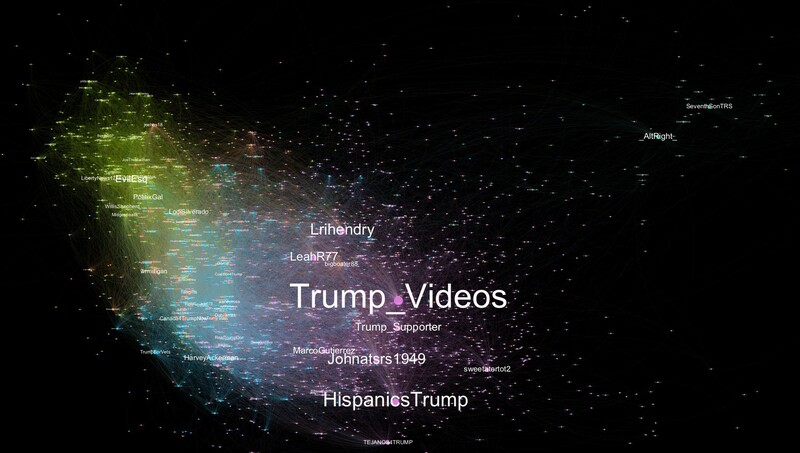 Network Visualization of top user segments from the initial users who posted to the hashtag in an organized fashion. Each color represents a different cohort — places in the graph where there’s much more density of connections. 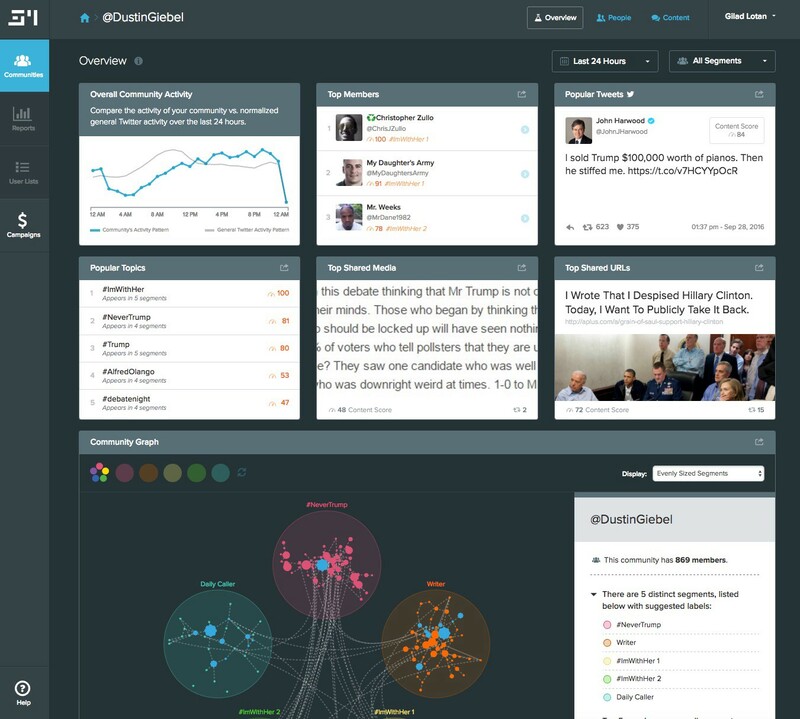 Each user cohort is then labeled based on unique yet important words and phrases associated with the users in the group. In this case, we see different flavors of Trump supporters — #MAGA (Make America Great Again), Trump, #Trump2012 and #TGDN (a tag used by conservatives to identify each other as a mechanism to boost follower numbers). Many of these accounts have words such as God, America, Family, Proud, Wife, Mother, Father and Veteran in their bios. A quick plot of the distribution of sources for the tweets shows a decent split between platforms, making it less likely for this to be automated / bot activity. 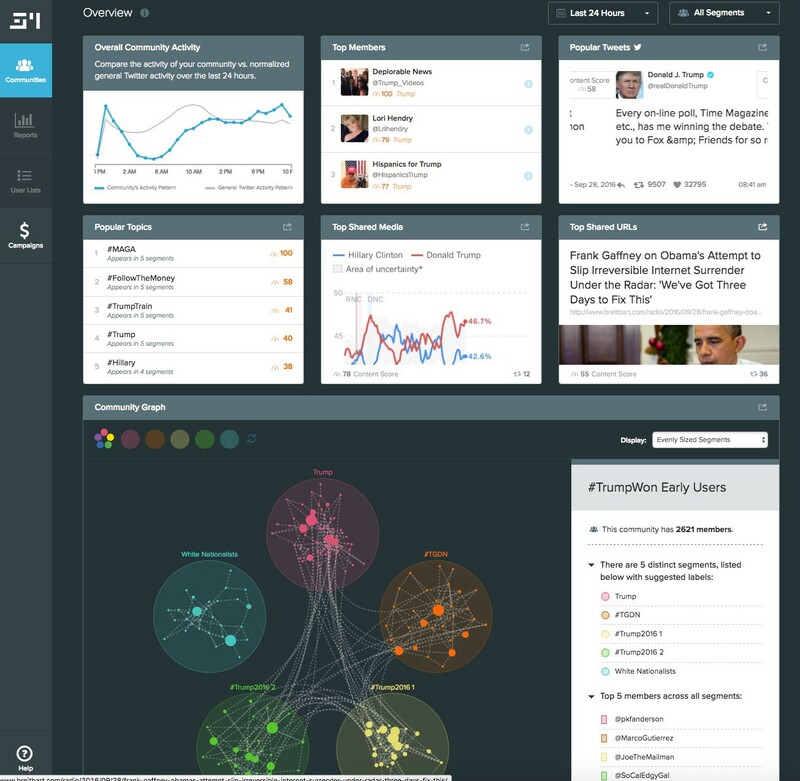 Finally we can take a look at the actions these users are taking — what content are they sharing, and how active are they over time (notice the massive spike — in blue- when the hashtag was shared by many of them). Trump apparently has a 4 point lead over Clinton. Hillary apparently cheated in the debate by sending hand signals to Holt (notice how active the comments are on this page). And Alicia Machado, former Miss Universe who came up during the debate, was “apparently” accused of threatening to kill a judge and being an accomplice to a murder in Venezuela (dailymail.co.uk). I’ll stop here, but I think you get the point. What’s clear is that there’s dense connectivity and a clear understanding of how information flows across participants. Users in these groups not only follow each other at significantly higher rates compared to the general Twitter user, but also clearly know who is a hub — who has the ability to accelerate the flow of information. Let’s take a look at the account that tried to spread the false information about Russia’s involvement. We can do this by seeding a Scale Model community with the followers of @DustinGiebel. 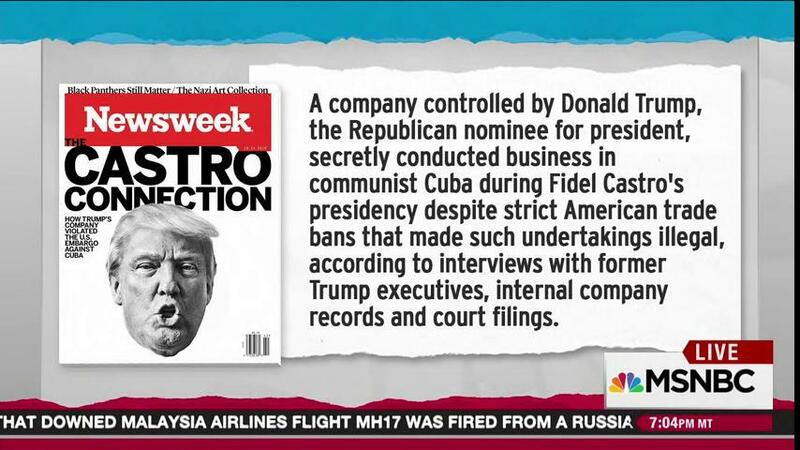 We are presented with a parallel world of propaganda — this time anti-Trump. As you can tell, very different vibe.